Saw this last week at our Trader Joe’s in California. Wanted to share with the rest of Briar. ….just wondering if those labels were printed letterpress?…. I think they printed them after they were put on the bottles. Is this this wine only sold in California cases? Especially amusing considering the long-time (and not entirely without merit) link between pressmen and alcoholism. Unfortunately a public house ,watering hole or nearest bar is the first comfortable place to unwind outside of the factory door ,routine becomes habit forming . The fact that grapes are pressed to make wine did not escape me. I have a few (now empty) bottles of 2006 Cabernet Sauvignon down in the shop that are there simply because they have label art that was created at Hatch Show Print. The brand was The Show, and it was bottled by Rebel Wine, St. Helena, CA. I guess a trip down to the local Trader Joe’s is now in order to pick up several bottles of Presswork. I will be hosting a visit and pot-luck lunch for the Print Club from the Des Moines Art Center in late April, I will probably have to uncork a few bottles for that occassion. This upcoming visit is what finally pushed me to get the shop cleaned up and organized. Things had piled-up for decades and I thought it would take a week to get the job done. It took FIVE weeks!!!!! Maybe I’ll have a bottle this weekend to celebrate that feat. What about the wine? Does it taste good? Inky flavor? There’s also a Cabernet Sauvignon version with slightly fancier label (thermography, off-white paper, red rubrication). Picked up a bottle yesterday. It might’ve been more fitting to use a picture of the common press (allegedly based on the one made for pressing wine) but this “Favorite” jobber sure is sporting. The printing house I was apprenticed to was established in the late 1800’s and their original indenture paper’s expressly forbade “haunting ale houses”. Perhaps these labels illustrate the inner demons that provoked their prohibition! Incidentally, I live an hours drive from the Barossa Valley. I’m a-goin hunting! The verbage of indenture papers was largely standardised from the earliest survivung papers around 1600 until well into the mid twentieth century. Clauses were invariably included undertaking not to frequent ale houses, gambling with dice and cards, revealing the employer’s trade secrets, etc. We printed a batch of indenture papers about twenty years ago. Since the holidays are fast approaching, I probably should update this thread. 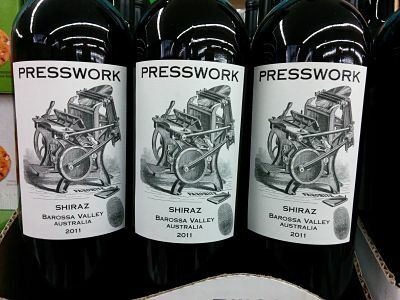 The Presswork wines are still available at Trader Joes in a selection of varieties. But “relatively” new and not mentioned here is Letterpress Distilling L.L.C. in the Seattle, WA area that bottles Letterpress V (a vodka) as well as Letterpress l (a limoncello - and yummy!!!!!!). Don’t know where it is marketed - I get my bottles from a sister-in-law in the Seattle area.